Daniel Njenga Maina, a former Compassion sponsored child. Njenga, as he prefers to be called, is 29 years old. He was born in Kenya, about half an hour away from Nairobi. 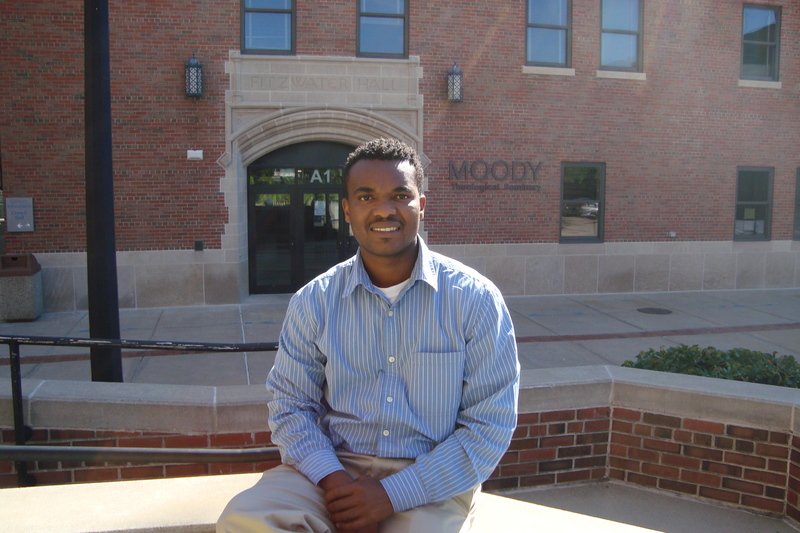 Njenga is currently studying Masters of Arts Intercultural and Urban Studies at Moody Bible Institute in Chicago. He will graduate in May, 2014. 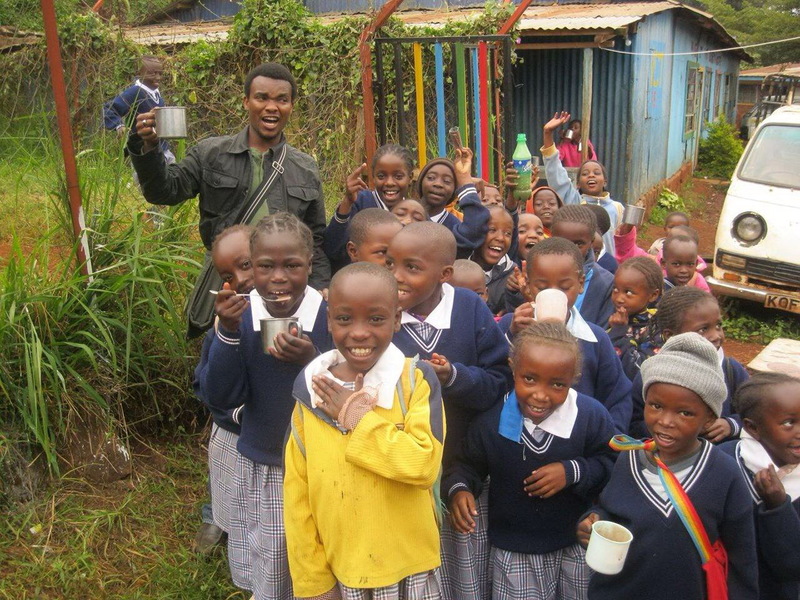 Njenga travels twice a month across churches in the US speaking on behalf of Compassion International. Njenga is also a church planting intern in a local church in Chicago and he works part time at Moody Distance Learning where he coordinates Graduate modular classes. When Njenga goes back to Kenya, he is planning to start a church, and concurrently train pastors and lay leaders in theology. He is also working towards helping a local school in Kenya in order to build a library, and hopefully some other schools will receive the same benefit in the future. Tell us about your background and what poverty was like for you when you were a child? For me poverty begins with my mom. My mom was 14 years old when she gave birth to me, so, a very young woman. She didn’t have any education. She was sent out of her home by my grandmother. And then, when I was 9 years old, my mom passed away. That was very hard! And you know, my dad was not there either! Actually, I never knew who my father was. My mom had tuberculosis and she couldn’t access medical care. That was a very hard season for me. By the age of 7 I hadn’t started going to school and we were living in a 10 by 10-feet house, a very small house. I took care of my sister who was three years younger than me. I mean, growing up was really hard in those conditions! There were not people who were wealthy where I was. There were so many drunkards. Drugs were being sold like a hundred feet away from my house. So, there was temptation to get into drugs growing up as a young man. And yeah… there was a very famous gang. And so many young people resolved to get into that gang as a way of escaping poverty. Happily, I never joined that gang or never got involved with drugs. I never went to church either. My grandmother did as she was Catholic. But I never went to church because my mom did not go to church at that point. Before my mom actually passed we moved into my stepdad’s house –my sister’s dad. He did what I would call ´mechanical work´ –gas welding. So, he worked somewhere in the field…places where cars were repaired. And he would just sit there and wait for work to come. So, that was very hard. You’d never know whether he would make money. There were times when we were at home, waiting for him to bring food because he didn’t leave us any money. And he would come back after walking about 25 kilometers… far, far away. And he’d come and say, “I don’t have any money for you today.” Then, we’d just drink water and spend the night in hope that the next day God is going to provide something for us. What was the concept that you guys had about God at that moment of life? Was there God for you? Yeah! I couldn’t feel anything. I mean I just covered my eyes but I was half open trying to see what’s going on. How was the experience of becoming a Compassion sponsored child? How did your life start to change? Oh, I think the biggest thing that happened to me was to become a part of a church. You know being introduced to the Gospel at such an early age is just awesome! As for me, when I look back, I see that as one of the greatest investments that was made in my life. Just the concept that you learn –God loves us! You know, for me that was a strange idea that somebody loved me because I think what happens when you are in poverty, the concept of love is a kind of hazy or it doesn’t make sense. And knowing that God is there for me, it just gave me hope! But also, knowing that someone is meeting your basic needs like food or health care when you go to the program; it truly gave me hope! I was also taught how to brush my teeth at the Compassion program. I received my first toothbrush and my first toothpaste. I have told people I almost ate the toothpaste because it was so sweet! It tasted so good! (He laughs!) And then I got, you know, a blanket and I had my own mattress… a comfortable mattress to sleep on and I would share it with my sister. Not only that, Compassion also paid for my tuition to start going to school and that opened opportunities for me to even start dreaming of who I will become. You know, I got text books, I got exercise books, and they paid for my uniform. My self-esteem was being built up above all. I even started to see love in myself. And all of this was possible because of my sponsors! How did you learn this concept of God’s love since you actually didn’t experience a real, personal love here on earth? Yes, it was hard growing up. My dad (stepfather) was very abusive in the sense that he would beat me a lot. I struggled so much although I knew that God loves me. When I was a teenager I stopped going to church. I would keep attending the Compassion program on Saturdays but I wouldn’t go to church on Sundays because I was struggling with that idea. I tried to run away from that as much as I could, but the more I ran away the more empty I became. And finally, my hope was only in the Christian faith. After two years, I went back to church and I rededicated my life to Christ. That changed things amazingly! One of those, I wanted to forgive my dad (stepfather) because I realized that my heart was so heavy and I couldn’t have peace with God. From that moment, I started to appreciate my dad (stepfather) more, you know, I started to see his efforts to raise us. I started to see all the struggles he went through without a wife. So, that made me appreciate him and respect him! Although, my dad (stepfather) never provided as much as I would have wanted him to, that never made me see God as a distant god. As for me, being part of the Compassion program was enough reason to know and understand that God is good. My needs were met. There was somebody far, far away that was concerned about me and that meant that there’s a God who truly loved me. Oh Yeah! How did you move from hopelessness to a life full of hope and dreams? You know, I’ve never thought about who I want to become. One day, when I was a child, I mentioned that I want to be a mechanic because my dad was a mechanic. Then, I did not only become a teacher but God also called me to become a pastor. And I’d never thought about going to seminary. Actually, I didn’t have any single coin to pay for my tuition. I had talked with people and I was hoping to do some fundraising. But Compassion, at that very moment, opened up the Moody opportunity and I applied for this scholarship to come to Moody Bible Institute in Chicago. I waited for about 5 to 6 months… it was very competitive! Students across the 26 countries where Compassion works were waiting for this great opportunity. I wanted to come to Moody and thank God I did! It’s been a great experience being here! So, from this special journey, what are your dreams and plans? And how God is leading you towards them? I’m also passionate for education. The opportunity to go to school has just given me the privilege to meet so many people and even to be here in the US. So, I have a friend who has given me a piece of land to build a resource center for the community. I want to come up with a model for Kenya where we can have a resource center in one place but it will also be replicated across the country. This resource center is a place where children can come and read a book or do their homework. People who’ve graduated from high school, they can come and help those students. It will be an opportunity to teach other young people how to give back to the country and to their communities what they have already received. I also hope that the resource center would be a place where pastors can come and prepare their own sermons and study more. I think seminars can be conducted as well. What is your main motivation to accomplish these ambitious goals? I think everybody needs to grow in excellence, you know to keep working on their skills. So, I feel that I want to do those things. But, I also need somebody else to keep pouring in me. I think that’s a very good concept… people pouring in you, you pouring in them, you pouring in others and they pouring in other people. Then, you will be able to see transformation! Because I would say we don’t need to excel for the sake of excellence. I think we need to excel for the sake of God’s name. I mean, if God created everything so beautifully, I think as Christians we need to exemplify that. God has created us different. He has given us so many gifts. So, it is the matter of using your gifts to serve other people. Because excellence is not just about us, it’s about other people. And people would be able to notice our excellence. Then, they will desire it and they will even ask…why do you do this? So, our excellence should make people ask questions about our faith.